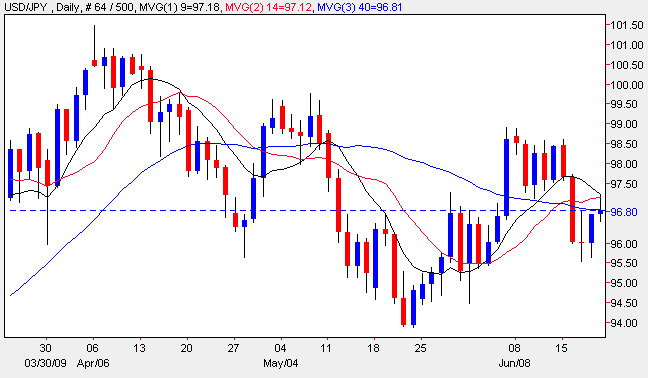 The dollar yen continued in its protracted and remorseless sideways consolidation yesterday reversing the trend of earlier in the week and closing the day up 55 pips but marginally below the 40 day moving average. Until this pair breaks out of this sideways range and we see a decisive break below 94 or alternatively a bullish move past 102 there is little more than can be said and it is certainly not a currency to consider trading at present. With no fundamental news on the economic calendar for either the US Dollar or the Japanese Yen today and with the weekend ahead, plus “triple witching” in the options market, then today’s price action will be more of the same. The only piece of news for the Japanese Yen came overnight in a Bank of Japan statement in which it became apparent that one of the items under consideration was whether the BOJ should slow down its quantitative easing measure and stop pumping cash into the banking system. The communique indicated that any change in policy would be made by the end of September, after due consideration of current market conditions.